Panelists at the BBCC5 Opening Ceremony. Dr. Nagi El-Saghir (center) with the winners of BBCC5's awards for best abstracts: Drs. Farah Nassar, Rita Saroufim, Sarah Daouk, and Elie El-Rassi. Dr. Mothaffar Rimawi and Dr. Nagi El-Saghir lead a tumor board session at BBCC5. Photos courtesy of AUB Photographer Hasan Nisr. The fifth annual Beirut Breast Cancer Conference (BBCC) completed its 2.5 days of activities with 250 participants and 40 speakers from Lebanon, Egypt, Jordan, the U.S., Switzerland, France, and Belgium. Global continuing medical education has become an important goal for ASCO and all major international organizations. ESMO already started a regional ESMO-ASIA meeting, and the ASCO Global Oncology Task Force recommended global oncology meetings in cooperation with regional and local societies worldwide. Many local societies and medical centers have been very active in this field and can provide valuable experience. ASCO Connection provides a perfect forum for exchange of experiences and ideas as it is widely read by ASCO members worldwide. BBCC is an annual first-of-its-kind specialty conference in Lebanon. It is organized by the Breast Center of Excellence of the NK Basile Cancer Institute of the American University of Beirut Medical Center (AUBMC), Beirut, Lebanon. We organize the meeting in collaboration with local medical oncology, surgery, radiology, and pathology societies, nurses, pharmacists, the Lebanese Breast Cancer Foundation, and the Arab Medical Association Against Cancer. We have didactic sessions with presentations on recent advances in breast cancer research and management and 1-hour tumor board sessions where a panel of experts and the audience discuss real cases of patients with breast cancer. Tumor board sessions have become very popular. Surgeons and medical oncologists enjoy the discussions and application of knowledge from clinical trials and guidelines on real patient cases. We also involve the Lebanese Ministry of Public Health, Lebanese Order of Physicians, and Order of Nurses in Lebanon, as well as national nongovernmental organizations (NGOs), in sessions pertaining to national cancer control, raising public awareness about breast health, and patient advocacy. We organize an Opening Ceremony but in a nontraditional way. Rather than holding useless time-wasting speeches and praises by and for people who hold public office, we organize a debate in the presence of health care authorities and leaders. The debate is moderated by Roula Mouawad, an experienced journalist with the major Lebanese newspaper Annahar. 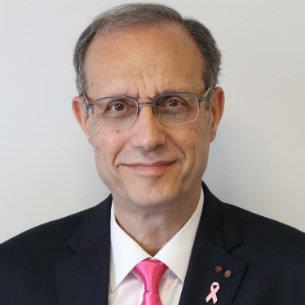 This year, after brief comments that set the stage for discussions by the chair and the president of Lebanese Order of Physicians, who represented the Minister of Health, the expert panel of invited societies debated needs for improving breast cancer awareness and screening campaigns. October campaigns for Breast Cancer Awareness Month and NGO work have produced a significant positive impact on breast cancer in Lebanon. New data shows that advanced cancer used to represent 65% to 70% of cases, but it is now only 35%. A study from the American University of Beirut presented at the meeting showed that over 80% to 90% of patients with early-stage breast cancer are alive and well after 5 and 10 years. The panel noted that we need to reach out to all women, particularly outside the big cities and in distant parts of the country. Panelists emphasized the need to use positive data on early detection: cancer does not mean death anymore, there is a higher chance of cure, not every patient will need to have a mastectomy or removal of all axillary lymph nodes, and a patient may not even need chemotherapy, hence sparing the patient from side effects and saving money for the government and insurers. The panel agreed that the public should also be informed that surgery and open excisional biopsy are not needed right away; mammography, ultrasound-guided biopsy, and staging should be done first. The presence of the media ensures that information is transmitted to the public. The panel agreed that all hospitals that treat patients with cancer should have multidisciplinary tumor boards, on which research was done at AUBMC and published in the Journal of Global Oncology. Consensus and locally adapted guidelines should be better disseminated and implemented; this will improve patient outcomes and save costs. Certification of specialists and CME issues were discussed. Study showing need for genetic counselors was emphasized. Large numbers of nurses attended and lectured in a special educational nursing oncology session. Oncology nurses have great role to play all over the world, especially in low- and middle-income countries. We believe that local and regional research should be an important aspect of oncology meetings. The research session was very well received. Four young fellows and students, Drs. Rita Saroufim, Sarah Daouk, Elie El-Rassi, and Farah Nassar, recieved awards for best abstracts. They presented their four abstracts on epidemiology, genetic counseling, microRNA, and adjuvant chemotherapy in Lebanon. The meeting was a nice forum for networking and making plans for research cooperation with colleagues from Europe and the U.S.